OKLAHOMA CITY (November 10, 2016) – When Price Brown took over as principal four years ago, Hilldale Elementary had a D- on its school report card. Flash forward to 2016: Hilldale now boasts a B on its report card, multiple championships in sports and academics, an explosion in enrollment and a reputation for engaging its community. “When you wander into a situation like that, you wonder what the quality of teaching is, but we quickly figured out there were really good teachers here. There just wasn’t a lot of focus on strategies that would transform those efforts into improved student performance,” Brown said. Hilldale, the largest elementary in Putnam City Schools, has gone from being a targeted intervention school to a High Progress Reward School, a designation reserved for schools that consistently show improvement from year to year. Brown attributes the school’s success to renewing focus on the needs of each individual child, expanding athletics and the arts, and putting technology into the hands of teachers and students. “Hocus pocus, everybody focus,” echo second-graders at Hilldale’s Action-Based Learning Lab. They stand ready on brightly colored exercise equipment, waiting for the clock to start. Their goal? To see how many high-frequency words they can read off a card in 60 seconds while walking, gliding, lifting and balancing. This process may be magical to them, but it’s neuroscience to their teachers. Studies show movement improves brain function, and the staff at Hilldale has doubled-down on that idea, giving classes 45 minutes to an hour each week in the lab to work out while reviewing multiplication tables or sight words. Hilldale financed its fitness labs through one of the nearly $300,000 in grants it has won in the last four years. Brown, who had never written a grant before he came to the school, now spends his summer breaks applying for them. Families at Hilldale have limited resources. Every child at the school qualifies for free or reduced lunches, and one in every five is homeless. In addition to time in the fitness labs, students walk one of three tracks outside the school for 20 minutes every morning, and after school, they play in the district soccer league. Hilldale has won the district championship the last two years. To see a video of Hilldale’s Action-Based Learning Lab, click here. With the lights off in Jeff Towne’s fourth-grade classroom, the bright glow of the SMART Board and iPads were the only source of illumination. The children had just finished working two division problems as a class on their tablets. “Now that we’ve warmed up, I want to push you a little bit. Do you want a hard problem?” asked Towne. “Yesss!” shouted a chorus from the middle of the room. “I’ve got this,” one boy whispered to himself. Two years ago, before Towne moved to fourth grade, he taught on the fifth-grade team with Britt Barrientez. Every one of their fifth-graders passed the math section of the Oklahoma Core Curriculum Test, the annual state assessment. Last year, they missed 100 percent proficiency by one question. Brown said technology has helped with their success. iPads have replaced pencil and paper in Barrientez’s classroom. In Brown’s second year the school went from having eight iPads in the building to a 1:1 ratio, meaning there are now iPads for all 800 students. Both Barrientez and Towne use the tablets to engage students, and an application called Reflex Math is one of the students’ favorites. The game-based application tracks student progress and displays the skills they’ve mastered and the goals they have yet to reach. English is a second language for 55 percent of Hilldale students, meaning teachers are busy developing strategies for reading. In 2014, the school won one of 20 Systems Changing Oklahoma Reading Expectations (SCORE) grants from the Oklahoma State Department of Education to promote literacy. It has used that in part to purchase a scripted phonics program called SIPPS, which Brown said has transformed the campus. For the last two years, Hilldale has won the local Battle of the Books, a quiz-bowl literature tournament. However, math remains a favorite subject for students, and teachers are not underestimating the power of science, technology, engineering and math, a quadrumvirate of skills known in education as STEM. This year the school is expanding its robotics program, and Brown is anxious to unpack the interactive iPad systems called Osmo that were just delivered to his office. “Kids enjoy school more when all of their needs are being met, so by doing all these things, it makes school a pleasant experience for them,” said Brown, who has seen attendance increase and enrollment grow by about 20 percent since he joined the school. To see a video of children interacting with technology at Hilldale, click here. In the courtyard, a group of visitors is meeting to discuss a plan to write a $100,000 grant for an outdoor classroom from Impact Oklahoma. Among the features would be seven raised garden beds, one for each grade level at the school. One of Hilldale’s biggest fans, Erin Carlstrom, director of education programs at Feed the Children, is leading the meeting. Carlstrom first met Brown when he approached her about becoming a community partner. Feed the Children “adopted” Hilldale and last year provided Christmas baskets – including blankets, books, toiletries, backpacks and a full turkey – for all 400 families in the school. Carlstrom has noticed a difference in the campus over the last few years, including increased involvement from parents, which she says is rare in high-need schools. She said the parents are proud of their school and grateful for the opportunities it is providing their children. Carlstrom is so impressed with Hilldale that she featured Brown in a success story video created for corporate donors. “When you walk down the hallway, you can feel it’s a very warm environment. The kids are respectful of each other and their teachers. It’s a happy place. You walk out and feel like that’s the best 20 minutes of your entire week,” Carlstrom said. To see a portion of the video Brown recorded for Feed the Children, click here. While teachers walk the hallways celebrating Silly Sock Day, the library is a solemn place. Today is the first day back at school after one of Hilldale’s third-graders was struck by a car and killed while she was walking to the park after school. A crisis team of counselors throughout the district has assembled to help children deal with the death of their classmate. Brown’s face drops when he talks about the tragedy. In his 39 years in education, this is the first time he’s experienced the death of a student. But the changed climate at the school, he said, is already helping the children process their grief. “Counselors have told us our kids are doing really well. Part of that is they’re really loved here and they feel safe. When something like this happens, you’re going to get a different response from kids who don’t feel that way,” Brown said. The school and community have already begun to rally their support. Hilldale staff filled up four rows at the girl’s funeral, with every grade level represented, and were planning follow-up home visits. The studio that takes school pictures donated a photo package to the girl’s mother, and counselors from other elementary schools in the district are spending time at the school so Hilldale staff can provide a sense of normalcy for the students. Hoggatt said about 30 students had visited the care stations that day where counselors helped them process finality and death. “I talked to a little girl who said she was her very best friend. When she first came here, she was the first one who talked to her. She drew a beautiful picture and wrote an absolutely beautiful note that will mean so much to the family,” Hoggatt said. Violins and cellos line the back of the new faculty planning room, added this fall when Hilldale expanded its early childhood building. However, teachers have yielded the space to accommodate the school’s growing orchestra. Last year, Hilldale began emphasizing the arts, and as a result, the number of students in its orchestra swelled from 7 to 70. The school provides all instruments through donations, so no family has to buy or rent. Brown said so many students are interested, some are having to share instruments until the school can find a way to acquire more. The school is even building an amphitheater beyond the playground to stage concerts. To see a video of the orchestra at Hilldale, click here. Just because the teachers have given up their room, it doesn’t mean they have given up strategizing. Giving back doesn’t stop when the bell rings. Hilldale’s teachers regularly volunteer in the community after school, and three of its first-grade teachers recently became foster parents. Staff turnover is rare, and many who have retired have come back to take on other teaching assignments. The teachers say that working in a high-needs school has its own special rewards. The children seem to notice they are important to the adults in their school, too. First-grader Tony Raygiosio Jr. says he and Brown go way back. He calls him his friend. The Oklahoma Association of Elementary School Principals named Brown its 2016 Principal of Excellence, but he is quick to point out that he’s stolen most of his good ideas. He believes that with the proper focus and resources struggling schools can turn their performance around. PHOTOS: Sofia Martin Botello (foreground) and Itamar Sanchez practice their balance while reviewing vocabulary words in the Action-Based Learning Lab at Hilldale Elementary in the Putnam City school district. Principal Price Brown said the children retain more knowledge when they review academics while physically active. 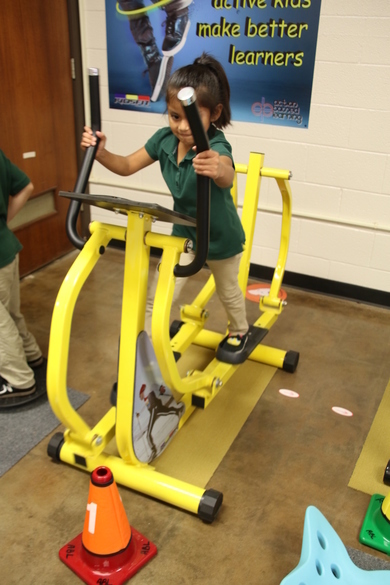 Darlin Ramos exercises on a machine in Hilldale's Action-Based Learning Lab. 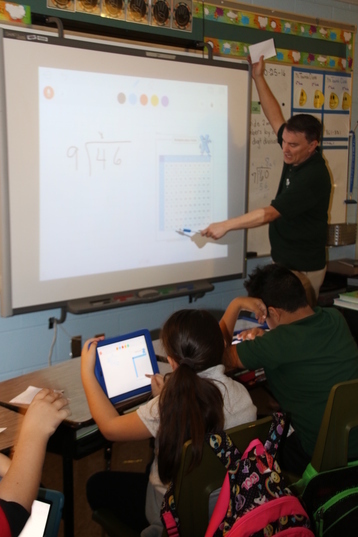 Fourth-grade teacher Jeff Towne leads children through division problems on the SMART Board. The children follow along on their iPads.